Coming to the Bay, and ready to experience the refreshing, distinct aroma of New Zealand native bush? Keen to dust off those hiking boots or get your feet wet? The vibrant Bay of Islands nature & wildlife has it all, from pristine beaches, whale watching, amazing vistas & so much more. If you’re after a fix of New Zealand’s natural environment and want a relaxing time doing it, the Bay of Island’s is the perfect region for you and your family to explore. There are incredible physical attractions like serene waterfalls, dramatic coastlines, unpolluted beaches and lush countryside. But when it comes to New Zealand wildlife, there’s also an epic story of survival to be told. Why is New Zealand’s wildlife so special, you ask? Ancient species of wildlife and fauna (plants) have evolved in a unique way on our island country, thanks to continental drift and eighty million years of isolation. So there are plants and animals here that you won’t find anywhere else on earth. 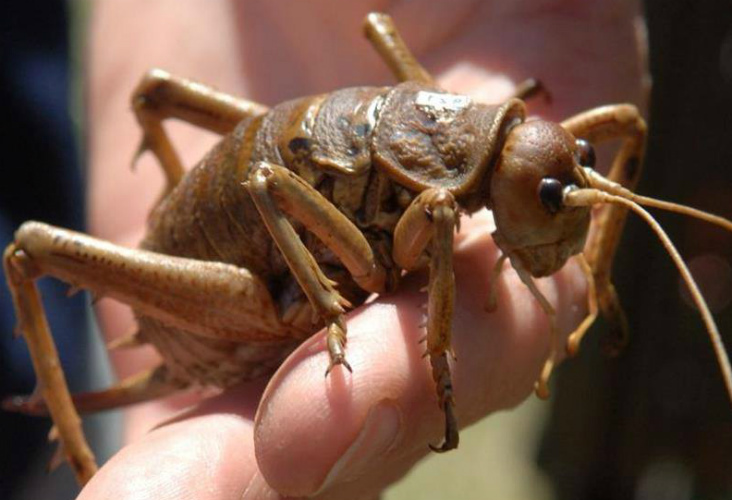 There are many creatures great and small to get to know, from shy flightless birds, the world’s heaviest insect, and even a ‘living dinosaur’. After only 1000 years of human’s living here, unfortunately, New Zealand has lost many distinctive native species due to hunting, land development and the introduction of pests. But thankfully huge gains have been made to protect and enhance what’s left in recent times. In total, around 30 per cent of New Zealand’s land area is now protected conservation land. Public authorities and private organisations have established intensive programmes to remove introduced pests like opossums, stoats, mice and rats. There are wildlife sanctuaries in many areas, and 13 beautiful national parks to explore. We’ve created maritime parks, world heritage areas, hundreds of nature reserves, a large network of marine reserves and protection for wetlands, rivers and lakes. New Zealanders are really welcoming for everyone to experience its unique and precious natural heritage. We only ask that you make as little impact as possible, so future generations can enjoy it too. Visit the Department of Conservation website for more. Before humans settled here, lets’ just say it would have been a very noisy place to holiday! Large tracts of lush native forest supported an incredible variety of bird life across New Zealand. As they evolved, wings became unnecessary for some birds, as they had no natural predators to fly away from. Unfortunately, many of these birds are now extinct, but some still remain and are protected, including our beloved Kiwi. The Department of Conservation (DOC) works hard to help protected birds, and educate us all on conservation. In the Bay Of Islands, ‘Project Island Song’ is also doing their bit. Project Island Song is an ecological restoration project across an archipelago of islands, all known as Ipipiri, in the eastern Bay of Islands. Each island sanctuary has been meticulously eradicated of pests and their aim is to reintroduce native species to the islands and continue to protect their delicate existence. It’s considered one of the most successful conservation projects in the country and it’s well worth a visit. 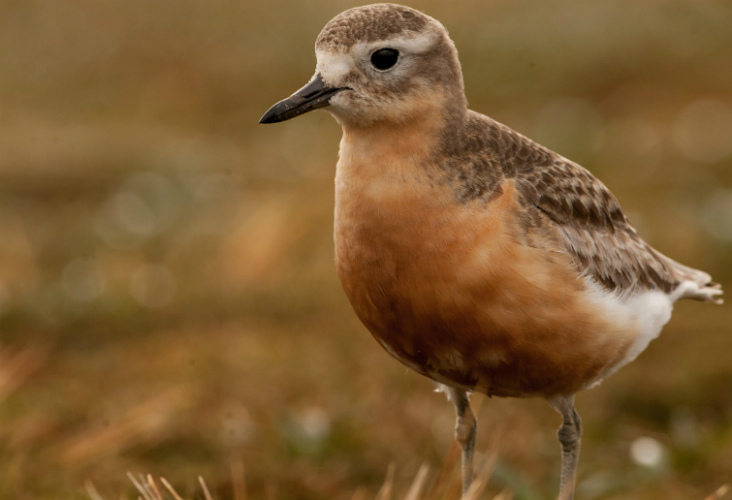 You can see Tūturiwhatu (New Zealand Dotterel), Oi (Grey-faced Petrel), Northland Brown Kiwi, Toutouwai (North Island Robin), amongst many other birds. Visitors say it’s like stepping back in time. Getting to Project Island Song is easy and visitors are welcome all year round. The visitor centre is located in Otehei Bay, on Urupukapuka Island. To protect the ever-growing birdsong on the islands they ask visitors to check for unwanted stowaway pests (in bags, bikes and boats etc) before heading out the islands. This is extremely important! There’s also a comprehensive list of birds that can be seen in the region on the NZ Bird website (with details and pics of each species) here. New Zealand’s high rainfall and high sunshine hours mean we have a lush and diverse flora (plant life). The majestic evergreen native forests are jaw-dropping to first-time visitors and the smells and sounds of the bush a familiar comfort to most New Zealanders. (You’ve probably worked out by now that New Zealanders often to refer to a ‘forest’ as ‘the bush’ – they’re fairly interchangeable!). Amazingly, the majority of trees and plants in the bush are native – so if you’ve never explored the unique perfume and scale of dense and often ancient New Zealand trees and plants, now is your chance. In and around the main cities in New Zealand you can spot Rimu, Totara, and many varieties of Beech. 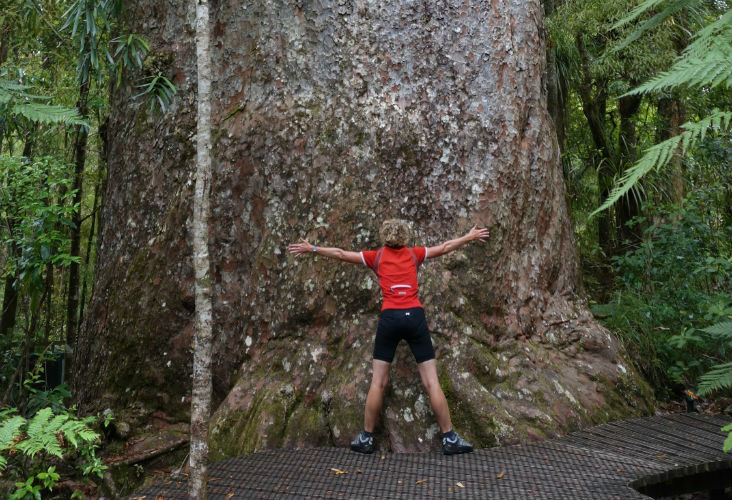 The largest native tree of them all, the giant Kauri, is well worth a viewing and Northland is the perfect area for this. The tallest NZ tree, standing at an epic 150 feet high, is the treasured Tane Mahuta (‘Lord of the Forest’), found in Waipoua Forest in the Hokianga region. It’s not too far from the Bay of Islands and makes a great day trip. We recommend the ‘Footprints Waipoua Tour‘ for a great guide to the native Kauri and other wonders of nature in Northland. Underneath trees in both dense and light bush areas you’ll find a plentiful undergrowth including countless native shrubs, a great variety of ferns, and many fluffy mosses and lichens. The beautiful yellow flowers of the Kowhai Tree are iconic. And up in the Bay of Islands (and across Northland), you won’t ever be far from a stunning Pohutukawa tree. 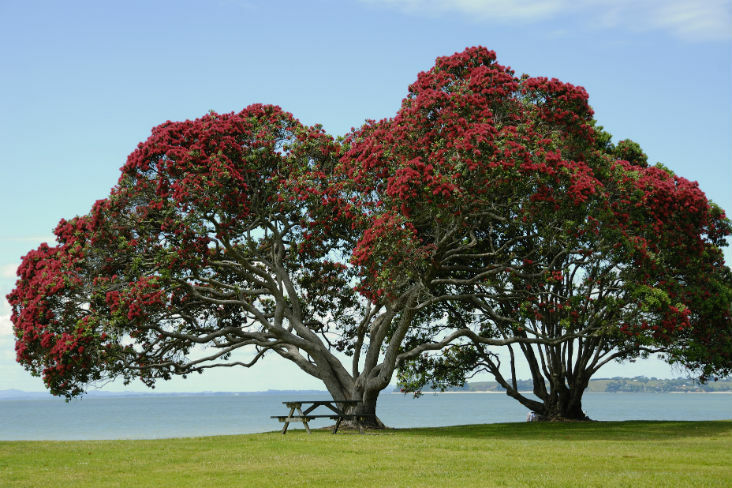 Its distinct, bright red flowers bloom from December and into summer, giving it the title of ‘New Zealand Christmas tree’. 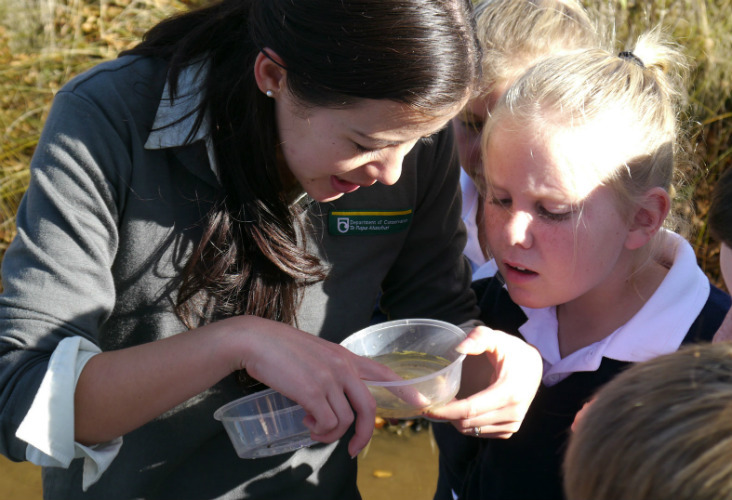 Naturally, we think that the best way to explore the native fauna in the Bay is to “go bush”. There are plenty of hikes (treks) around, from those that are really off the beaten track, or others that are nice, leisurely strolls. Check out our blog on walks and hikes in the Bay of Islands. Important note for bushwalkers: help stop Kauri Dieback Disease! 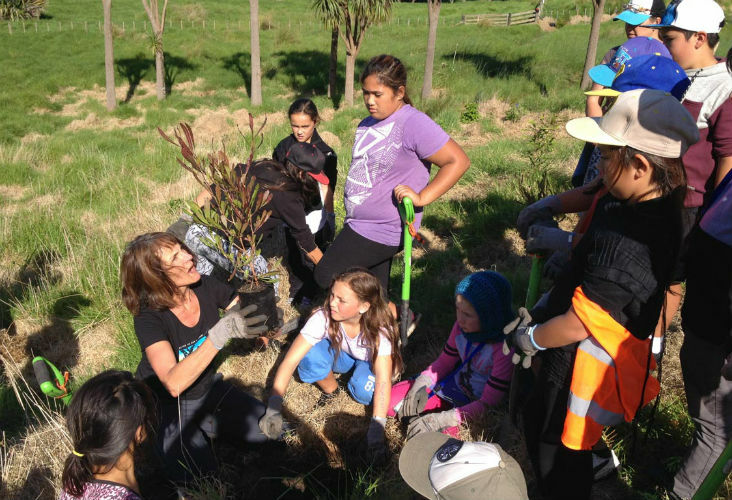 Our precious native Kauri Tree is currently under threat from Kauri Dieback Disease. It spreads by soil movement, and you can help prevent it by staying away from kauri tree roots, and cleaning your gear (especially shoes) before and after visiting kauri forests. Most tracks around these forests are all-weather tracks (but we recommend always packing water and extra clothes in case of weather change), and can cater for the less able or time poor with a 10-minute Kauri Boardwalk, right through to a hardy two-day hike. And DOC has a great list of the walks available in the area here. We thank our lucky stars for the beaches here in the Bay and Northland – some of the best in New Zealand, if not the world. Think wide, sandy expanses, lapped by gentle waves and with pohutukawas spotted along the shore to snooze under. Or wilder coastlines, with surging breakers and omnipresent salt spray. Or maybe you want a more remote, hidden cove with golden sand and accessible only to the determined? We’re spoiled for choice with the number of beaches, so we’ve narrowed it down to our favourites and the most accessible for tourists. 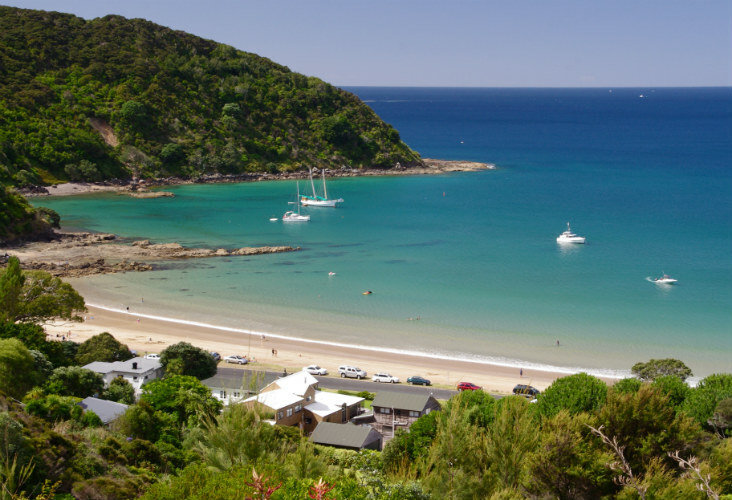 If you want more details, check out our post on Best Beaches in the Bay of Islands. An awesome place for a dip to cool off, but most appealing is that it’s the perfect launching spot (hire options available) for water sports like kayaking, sailing or snorkeling. Suitable for swimming and fishing. It has a children’s playground at one end, making it a popular spot for families. Secluded bay with no road access. To get there, just walk around the rocks at low tide from the southern end of Paihia Beach. Easy 20-minute walk from Russell’s township and you can enjoy views out to Roberton Island. A half hour walk over Flagstaff Hill from Russell. It’s sheltered and has very little foot traffic. 30 minutes’ drive from Russell, this is a surf beach popular with campers and those looking to hide away. The perfect setting for a romantic sunset stroll and is a must visit for people who are fine with going off the beaten track a little. Lovely spot right where the ferry unloads passengers on the Island. If you’re happy to explore further, the island of Urupukapuka is abundant with world-class beaches and wildlife. Here are our top picks for waterfalls in the area, or you can read our comprehensive guide to the best waterfalls the Bay of Islands has to offer. 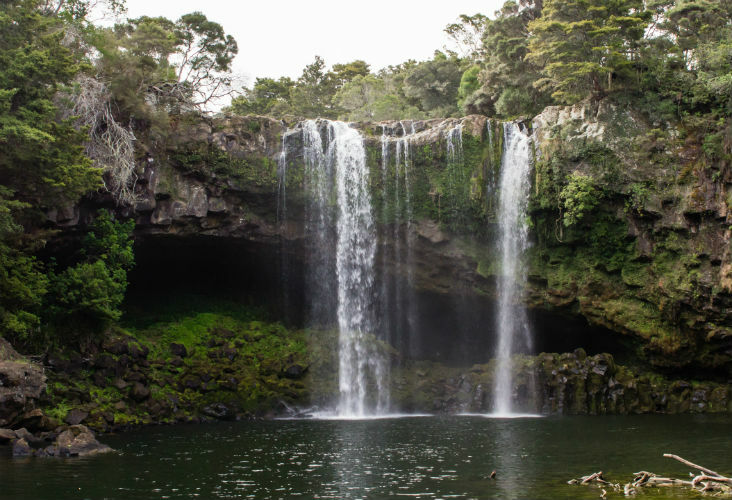 Only a ten-minute drive out of Kerikeri, you can take a wheelchair accessible ten-minute walk from the car park to get a close-up view, or you can see the falls at a good distance only 1 minute from the car park. Haruru means “big noise”, and the waterfalls in a rare horseshoe shape, so it’s well worth a drive or walk. Maori legend says that a taniwha (water monster) lives in the lagoon below the spectacular falls. Let us know if you spot him! You can drive and park there, but we’d recommend taking the walking track between the Falls and the Waitangi Treaty Grounds, part of it a raised boardwalk over tranquil mangroves. It is around 6kms one way, which is around 2.5 hours so you’ll need a coat and decent shoes. There’s an interesting history to the Haruru Falls township too. The town was New Zealand’s first river port, and a busy path inland for Maori tribes and for the early vision boats. Missionaries once documented 60 to 100 canoes pulled up on the mud banks here. In the 1800s, more than 100 Maori villages lined the banks of the local Haruru River, which flows down to the sea at Waitangi. These waterfalls are accessed via the Kerikeri River track, along the bank of the river. This beautiful walk passes through young kauri, totara and other native trees. You’ll also pass the remains of the Kerikeri hydro-election station (built as part of the hydro-electric generation scheme that operated between 1930 and 1967). The building’s remains are open so you can stop for a breather on the way. 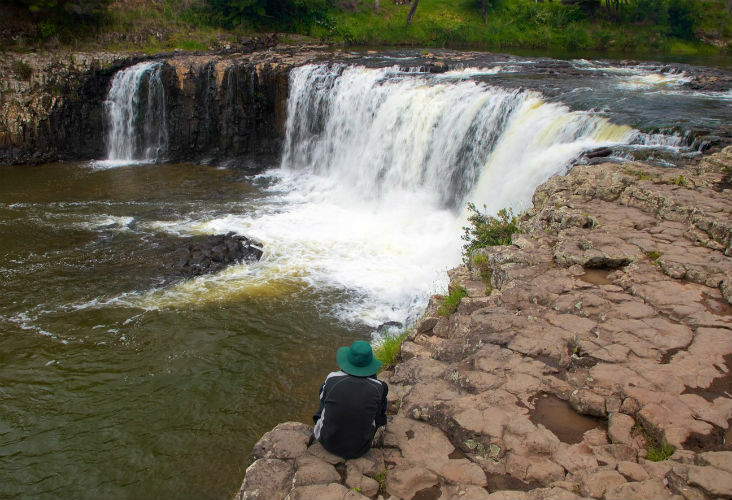 There are great rock formations close to the Wharepuke Falls, and once you’re there, there’s a popular swimming hole in the summer. Head ten minutes west along the river from the Wharepuke Falls, the Kerikeri River Track goes under the Heritage Bypass and takes you to a quaint seating area at the Fairy Pools. A round trip is over 6km, but it’s a fairly easy walk there and back. Thanks to its subtropical climate and sheltered waters, the Bay of Islands is a haven for lots of New Zealand wildlife, including dolphins, whales, seals, seabirds and many species of fish. There is a number of world-class marine tours available – here are some options. It’s documented that over 500 wild dolphins live in the pristine waters of the Bay, so it’s naturally one of the best places in New Zealand to have your life-changing close encounter. 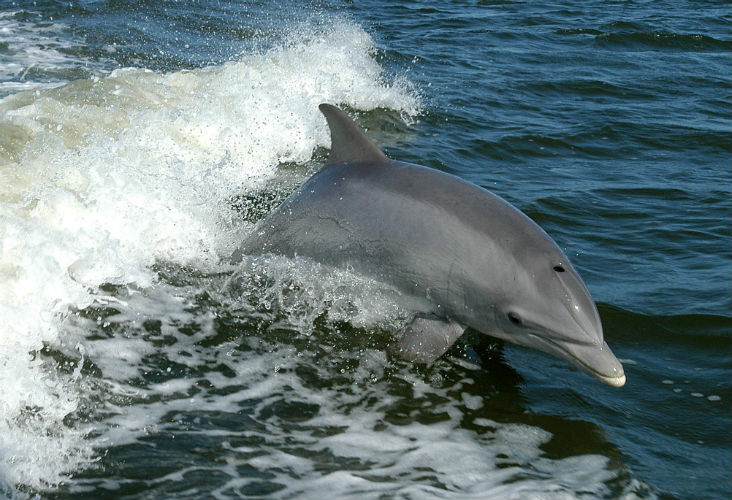 You’ll most likely see pods of bottlenose dolphins and common dolphins. You can tell them apart by their size and fins as they bob out the water to play or hunt. 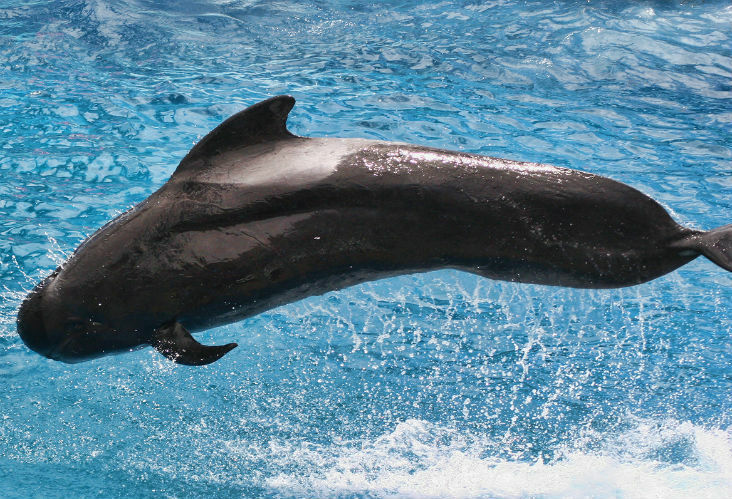 The bottlenose is the larger of the two, with a relatively short beak and a hooked, dorsal fin. They have dark or light grey backs. 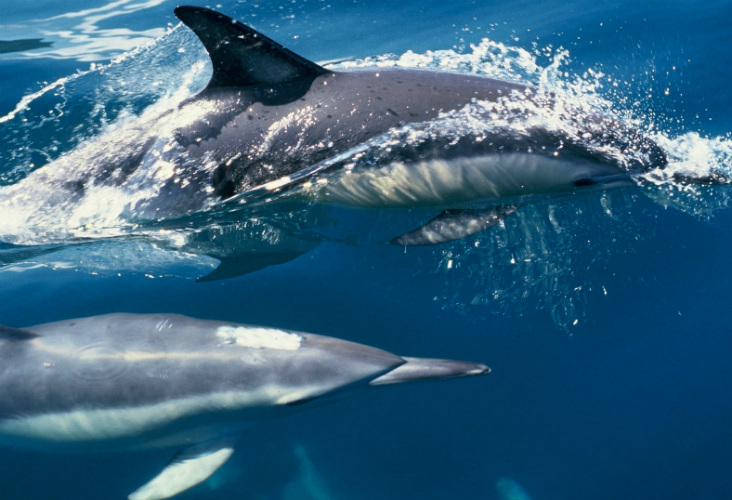 The Common Dolphin is smaller and has taller dorsal fins, and distinct, pale side patches. Getting close to these incredible creatures could be one of the greatest experiences of your life. But it’s recommended that you only ever swim near dolphins with a registered guided tour operator. This is important for conservation purposes as well as your own safety. Read our blog on Swimming with Dolphins in the Bay. Orcas, sometimes known as killer whales (a rather unfortunate title! ), are actually members of the dolphin family. They are iconic and easy to spot thanks to the black backs and white patterns on their stomachs. When Orca’s hit town, dolphins seem to leave! The long-finned pilot whale is also a member of the dolphin family, and can be very social, often found coming curiously close to boats in the Bay. 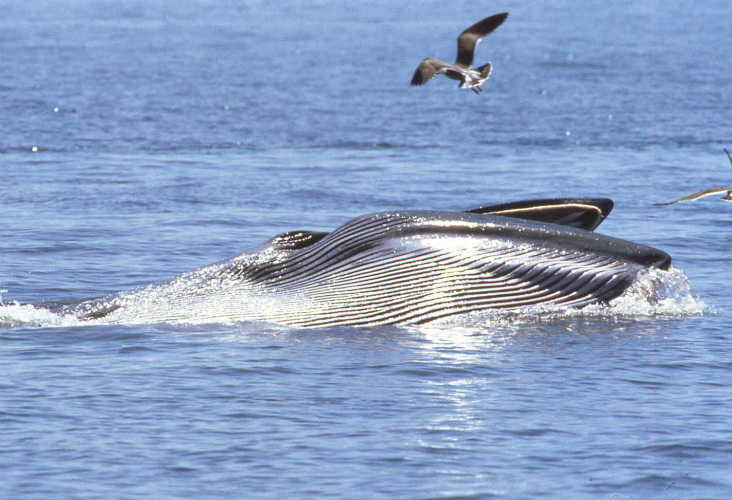 Bryde’s (pronounced ‘brooders’) are baleen whales and have a bluish-grey body with white on the underside. They have two blowholes, like all baleen whales – a way to tell them apart from their friends above with teeth. A Bryde Whale might also identify itself by a large cloud of vapour, and then rolling on its side to feed – quite a sight if you’re lucky to spot this. You shouldn’t approach dolphins or whales if you’re in a private boat – keep your distance. Instead, we’d recommend a day cruise guided by experts. Here are some recommendations. If you’re keen to throw over a fishing line, in terms of light tackle you could catch Kahawai, Snapper, Trevally and Kingfish. They’re all extremely tasty. Game fishing has always been popular up here and there are plenty of tour options where you could catch marlin, tuna and more. Here’s a list of our favourite fishing charter suppliers. There’s a great array of colours and unusual creatures to spot if you’re a snorkeler or diver. We’re blessed with a ‘blended zone’ in the Bay that’s often referred to as subtropical – with tropical fish brought down by currents to our temperate environment. In terms of New Zealand water residents – you could spot the largest stingrays in the world that weigh over 300kg and can be up to 3 metres across. The terrain under the sea here is relatively volcanic, forming great caves and caverns for divers. Attached to rocks and boulders is a forest of kelp that grows to around 1.5m high, which is quite different to tropical reefs in other parts of the world – adding both atmosphere and marine life. There are also huge Moray Eels lurking about. If you’re a late-summer diver, you could see Sea Turtles and maybe even Whale Sharks. Diving the Bay provides you with two historically rich shipwreck sites, each with their own unique underwater ecosystems. If you want to learn to dive, The Bay is the perfect place to do it. Here’s a blog on Learning to PADI dive in the Bay of Islands. And for experienced divers/snorkelers who want to join a tour – here are our top picks. 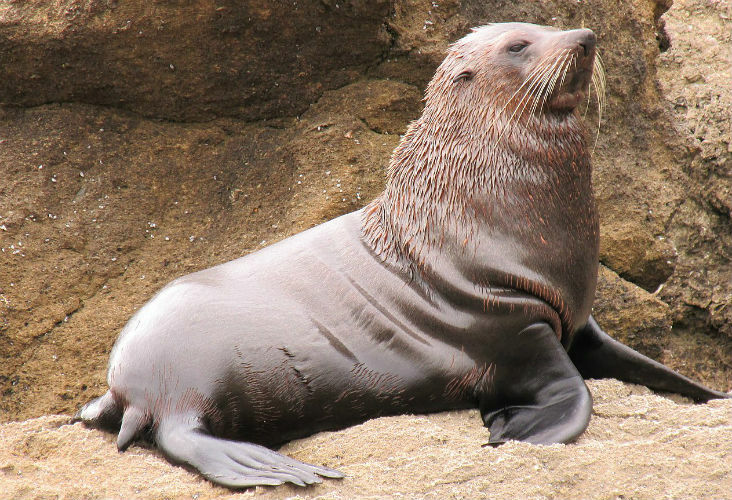 The New Zealand fur seal, or ‘kekeno’ in Māori, is the most common seal in New Zealand waters and be spotted across coastlines in Bay of Islands. They mainly feed at night, as prey is closer to the surface, which is why you’ll usually see them dozing and looking plain lazy during the day. Despite how chilled out they may seem, it’s best to never to get too close – they can get territorial and protective of pups – and can move quickly! There’s nothing better than garlic and olive oil lightly pan-fried with some fresh New Zealand scallops. But there’s a seasonal restriction on scallops to look out for if you’re lucky enough to dive for them (or know people that can). And while local oysters and mussels are available all year round, they’re at their very best during spring. Please check NZ Ministry of Primary Industries for all recreational catch restrictions. The Kawiti Caves are also known as the Waiomio Caves, and are a few kilometres south of Kawakawa. Visitors flock to see bizarre karst features, stalactite formations and spectacular glow worm displays. The caves are owned and operated by the Kawiti family, and they’ll take you through a magical 30-minute guided journey.